A dark money nonprofit is teaming up with a project launched earlier this year financed by political billionaire activists Tom Steyer and George Soros in a bid to boost Democratic causes and candidates in at least 11 states, according to campaign finance disclosure documents. The State Engagement Fund, a 501(c)(4) based in Washington, D.C., does not have to disclose its donors. From late August through September, State Engagement Fund made four donations worth $2.1 million to State Victory Action. State Victory Action, meanwhile, is a 527 organization formed this year. 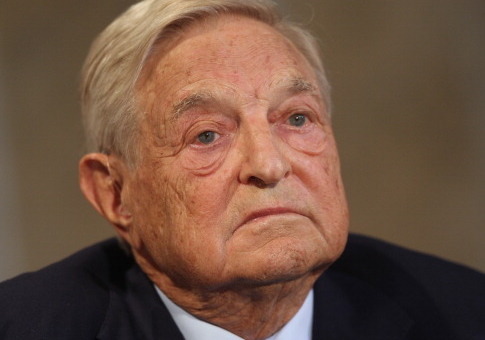 Previous disclosures showed nearly all of that group's $11 million in seed funding had come from billionaire political activists Tom Steyer and George Soros. The Washington Free Beacon reported earlier this month that State Victory Action was rolling out a strategy focused on state-level politics and candidates in Minnesota, Colorado, New Mexico, Nevada, and Maine. However, a new IRS filing by State Victory Action also shows the group is active in Pennsylvania, New Hampshire, and Florida, and has made minor contributions in other states like Michigan, New York, and Maryland. Because State Victory Action has distributed nearly all of its money to state-based political committees, most of the $2 million given by the State Engagement fund is at work influencing election outcomes in some or all of the areas mentioned, but the source of that money and influence is untraceable. Furthermore, numerous pieces of evidence create a strong circumstantial case that the State Engagement Fund has strong ties to the Democracy Alliance, one of the top donor clubs focused on advancing the progressive agenda. For example, the State Engagement Fund's principal officer is listed as Anne Bartley. An online biography for an Anne Bartely posted with a D.C.-based foundation says she has "participated in the founding of several organizations," including the Democracy Alliance. A person who answered the phone listed for the State Engagement Fund on IRS filings said questions about the organization should be directed to a North Carolina attorney, Michael Weisel. Weisel is also listed as the custodian of records for State Victory Action. Weisel declined to comment for this story, and thus did not confirm if the Anne Bartley listed as the principal officer of the State Engagement Fund is the same as the co-founder of the Democracy Alliance. Other disclosure documents reinforce the circumstantial case of close ties between the State Engagement Fund and the Democracy Alliance. The group’s annual IRS report summarizing their activity in 2016 shows a $755,000 grant was made to the Committee on States. The Free Beacon reported in 2014 that the Committee on States was essentially being created to act as a state-level arm of the Democracy Alliance. Another document posted by Mother Jones lists an Anne Bartley as a founder of Committee on States in 2006. The same IRS disclosure also showed a $647,500 grant from State Engagement fund to America Votes. The previously referenced biography for Anne Bartley also states she was a cofounder of America Votes. Outside of that state-level spending, State Victory Action also gave $2.5 million to Emily’s list, and roughly $2.5 million split between For Our Future and For Our Future Action Fund. For Our Future is a super PAC launched in 2016 by labor and teachers unions intended to stop the Trump candidacy, according to a report by Politico. This entry was posted in Issues and tagged George Soros, Tom Steyer. Bookmark the permalink.